Back in 2014 Amazon opened Pandora’s Box with the launch of same day delivery for products ordered on its e-commerce portal. Often viewed as a double-edged sword, the concept comes with a price tag for both buyers and sellers: consumers pay extra for the convenience factor and retailers also bear a fair share of the delivery costs. Nevertheless, statistics show the same day delivery trend is here to stay. By 2018, experts predict that in the top 20 U.S. cities alone, $4 billion worth of merchandise will be delivered the same day as ordered. Same day delivery is definitely not an easy task for retailers. It requires warehouse automation and a flexible inventory management system to ensure customer satisfaction. Before committing to same day delivery schedules, merchants need to ensure that their local inventory is sufficient to guarantee timely delivery. Customers certainly do not want to be turned down at the last moment after being promised delivery the same day. Hence, there needs to be real time inventory visibility across delivery zones to ensure last mile commitments are met as prescribed. Same day delivery requires swift packing and parcelling of goods from warehouses. When designated same day delivery schedules are introduced in a city, the merchant needs to ensure that the staff at the concerned warehouse are quickly acquainted with the necessary schedule and task changes to accommodate speedy packing and parcelling. There is a rampant need for merchants to have partnerships with an efficient network of logistics partners, supply chain vendors, localized delivery units and other folks involved in fulfillment. 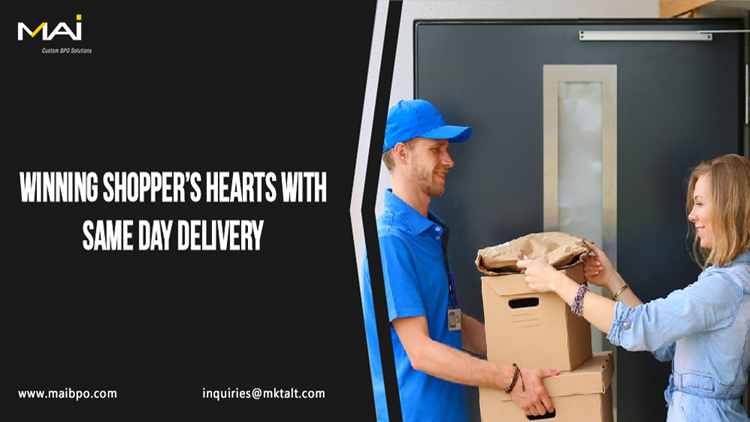 Same day delivery schedules can be met only if the seller has the products ready, and if the delivery partners can efficiently traverse through the shortest route and reach end-customers quickly. Besides, if the shipment involves perishable goods, then handling, storage and logistics needs special care and attention, as in case of fresh vegetables, fruits, flowers, etc. Besides setting up partnerships with leading fulfillment vendors, merchants should have multiple levels of delivery service available at the partner’s disposal. For example, some goods that require delivery within hours could follow the pizza delivery model, where delivery folks rely on two wheelers. For certain locations, to reach goods the same day, multi-modal shipping through air or road or rail may be required. From connecting with delivery partners to real time inventory to customer feedback aggregation, merchants need to deploy an effective technology backend to support their fast paced delivery network. Real time events need to be tracked to ensure that goods are delivered at the right time to the right people in the shortest, most efficient and most profitable delivery schedule possible. A high degree of automation needs to happen at multiple delivery service levels to ensure that inefficiencies are weeded out and deliveries happen within the shortest timeframe possible. The trend of same day delivery is now being increasingly adopted by popular brick and mortar stores as well as e-tailers. E-commerce players have already gone miles ahead with their innovations in this space and if you aren’t yet offering same day delivery, you are losing out on a large customer base.